A popular term in business nowadays is "thinking outside the box." I always thought that was the definition of creativity and imagination. 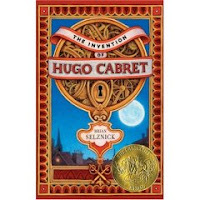 I just finished reading the new Caldecott Medal winner, "The Invention of Hugo Cabret" by Brian Selznick. What a great example of thinking outside the box. This is a huge volume of 534 pages! It is very unusual for a book that looks like a novel to win the prestigious award for picture books. That is because there are 284 illustrations in this book! Like a picture book, the illustrations tell a great deal of the story. I applaud the Caldecott committee for thinking outside the box and giving this wonderful volume an award. Take a look at this book and enjoy the journey of being in France during the 1930s. I have had the task of looking through current assessment procedures and requirements lately and I am struck again by the critical need to authentically assess a child. It is so important not to use only one way to evaluate the progress a child is making. The teacher must view progress from every angle of the child's life. That is one thing that standardized tests cannot do. Although formal tests might serve a purpose, they are very inadequate for identifying what a child has learned. It is too bad when officials look at those types of scores to assess learning. They represent only a small piece of the pie. The beginning of a new year provides an opportunity for all of us to make a new start on improvements that we would like to make. My 17 month-old granddaughter has been staying at my house for a couple of days. Watching her explore new things and make new connections has reminded me how nice it is to have a fresh start to parts of our life. Of course I have some of the basic resolutions, such as eating healthier and losing a couple of pounds, but my goal this year is a little more dramatic. I would like to help even more teachers this year become appropriate in their approach to young children. I watch my granddaughter become excited and scream, "Keee," when she sees the kitty. I want to watch teachers and caregivers with that type of excitement when they discover appropriate approaches for children.